The city of Darjeeling produces some of the most sought after varieties of tea in the world. 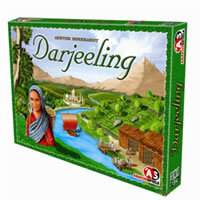 In the board game Darjeeling you and your opponents will be searching for the most favorable teas. Travel the area to find the greatest amounts of tea to be shipped out for consumption. The different types of Darjeeling tea will have you and your opponents searching out the varieties of tea that will gain you the most points. Darjeeling is all about who can get the most and find the best varieties of tea. Try playing Darjeeling today. See the Darjeeling game rules and instructions. Please keep in mind that the official Darjeeling board game rules and instructions could be different depending on the game version you have. The rules below are some of the exact directions on how to play Darjeeling. Share with us your comments, funny stories, tips, advice, strategies, creative ways to play, questions about how to play, problems with the rules or anything you want about Darjeeling. All submissions will be reviewed within 24 hours. Click here to add your Darjeeling comments.